Mission Details: The Arumaze have undertaken the reconstruction of the Leaf's hospital. 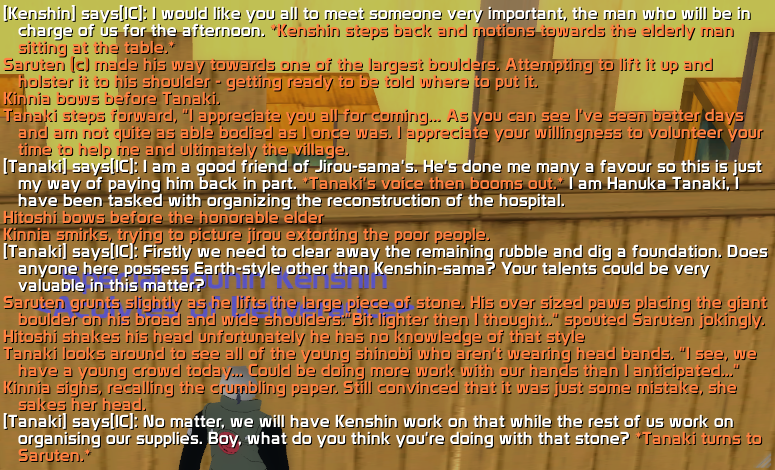 Jirou Arumaze has recruited an old friend, Tanaki Hanuka a master builder, to lead the project. 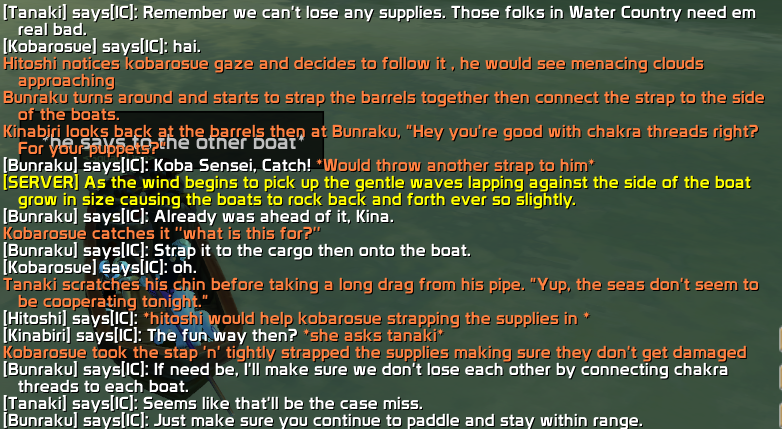 Tanaki had Kenshin assist him in organising a shinobi force to assist in the labour. Mission Results: The foundation was poured, beams laid across the pillars, and pillars cemented in. Some of the girl academy students assisted in cutting and sorting planks to be used for the walls. 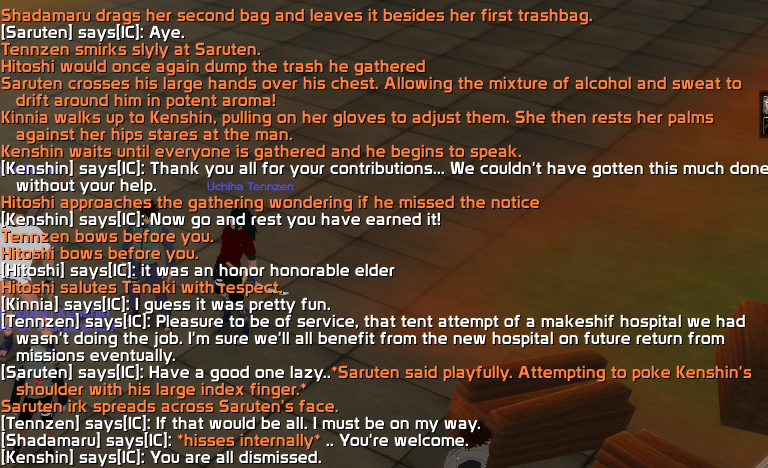 Casualties: Shadamaru had a splinter. 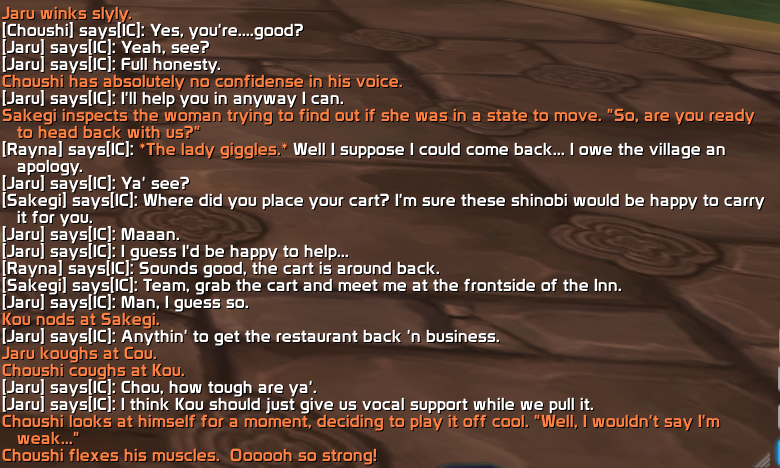 Mission Details: The owner of the Restaurant in the Hokage Plaza had fled the village last seen headed out of the Northern border. 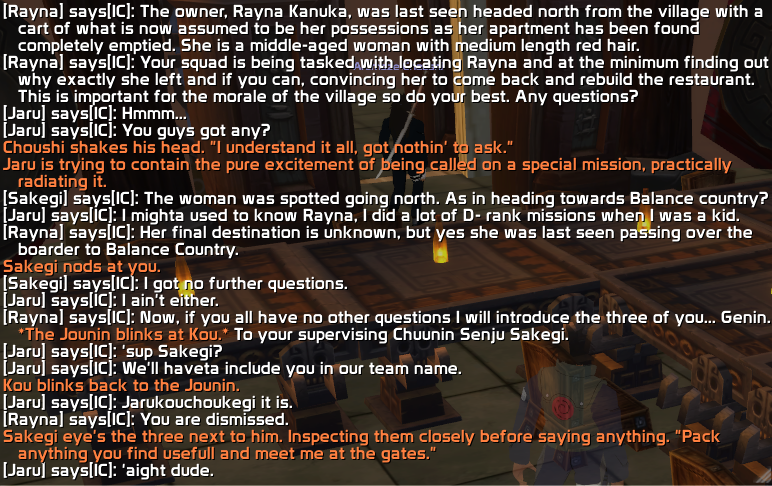 Sakegi, Choushi, Kou, and Jaru were sent on a mission to locate her and try and bring her back to the village if possible. 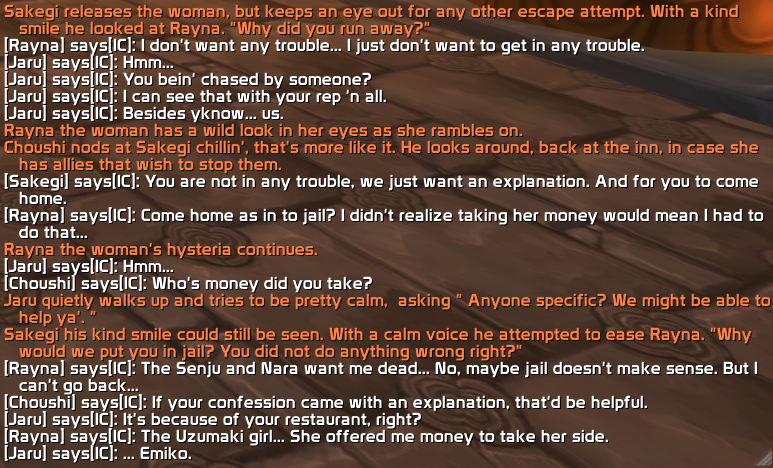 Mission Results: The group was able to successfully find Rayna Kanuka in Restaurant Country where she had fled fearing for her life after hearing the news of Shikaru Nara's death. The squad discovered that she was scared that the Senju alliance would blame her for the death of the young Nara and decided to run away. 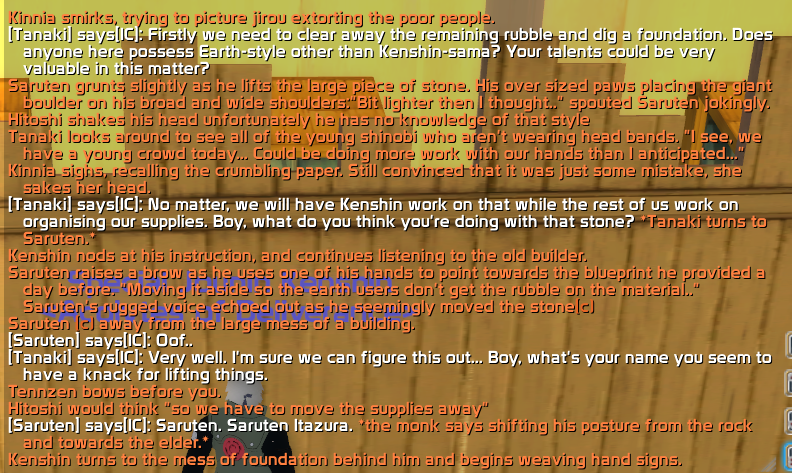 The group of eager genin was led by the Senju clan representative so they were able to persuade Rayna to return and make amends and rebuild the restaurant to its former glory. However, on the way back to the village Rayna informed the group that she had to stop to meet a contact near the border of Balance Country and the Land of Fire. 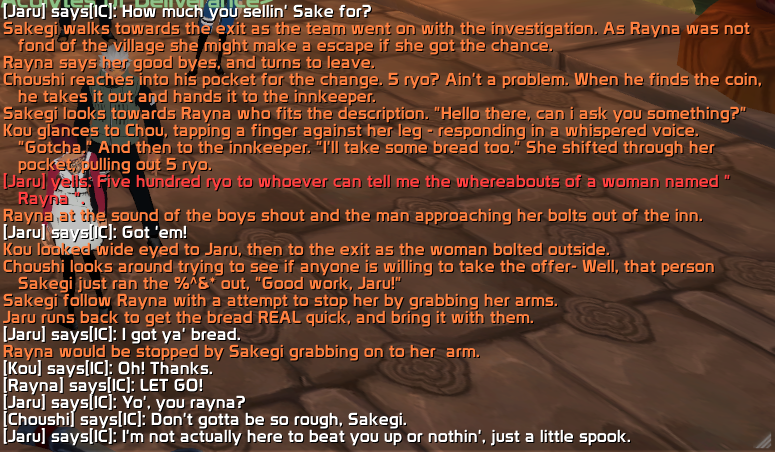 It was in a building that the group was instructed to wait outside of that Rayna disspeared after letting out a single scream for help. The squad searched high and low and was only able to find evidence of a minor struggle in the room and no way for Rayna and the kidnapper to escape. 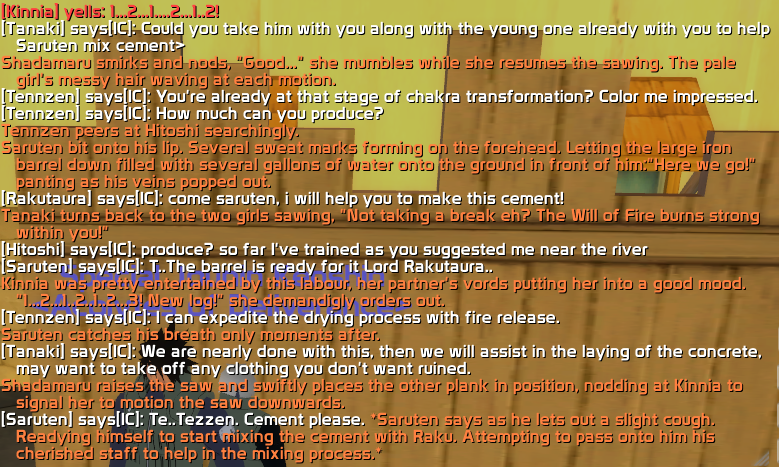 Mission Details: A wealthy businessman of the Land of Fire sympathizes for the people of Water Country and has requested Leaf Shinobi assist one of his workers in delivering remedial supplies to the people there. Mission Results: The group was able to successfully deliver the supplies to Water Country. 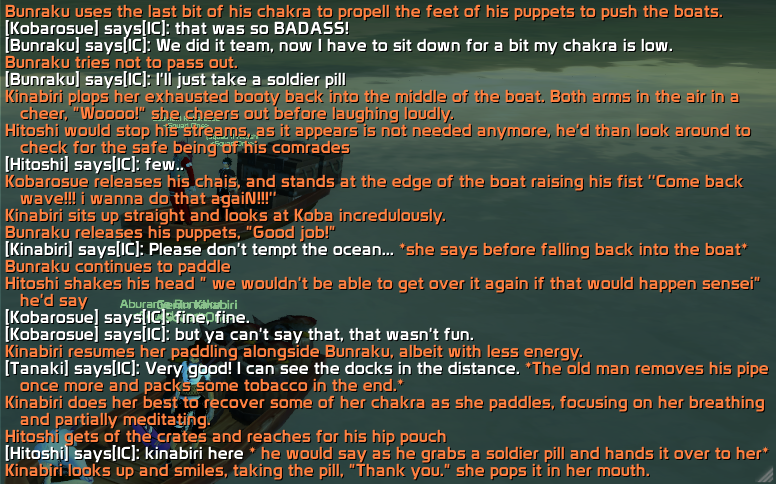 They encountered a storm on their voyage over the Eastern Sea, but were able to overcome it with the use of good teamwork and ninjutsu. The supplies were unloaded on the main dock of Water Country along with the man they were escorting. 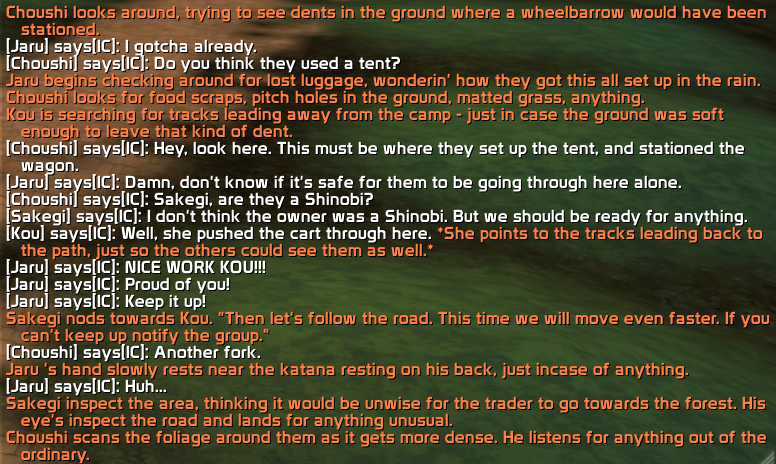 Mission Details: Konohagakure has been under lockdown for two weeks after a domestic terrorist act. 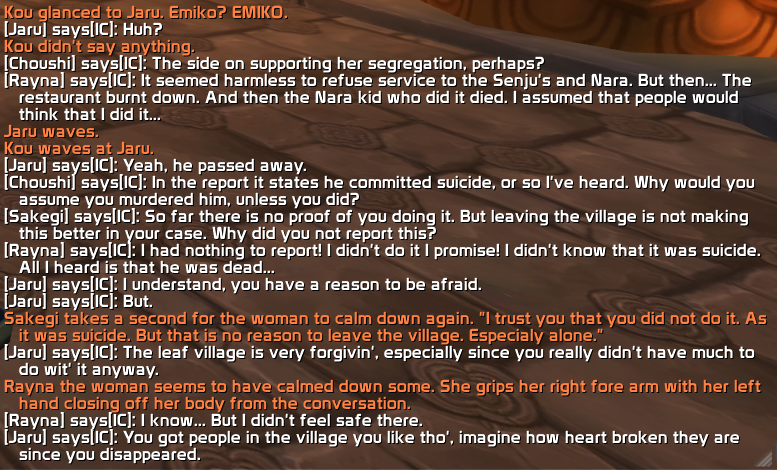 No one including shinobi were permitted to enter or leave the village. As soon as the lockdown was lifted the village sought to re-establish their presence in the Land of Fire. A squad of high ranked shinobi were sent out to check in with several important locations in the Land of Fire and see what their state is after the two weeks of no communication. 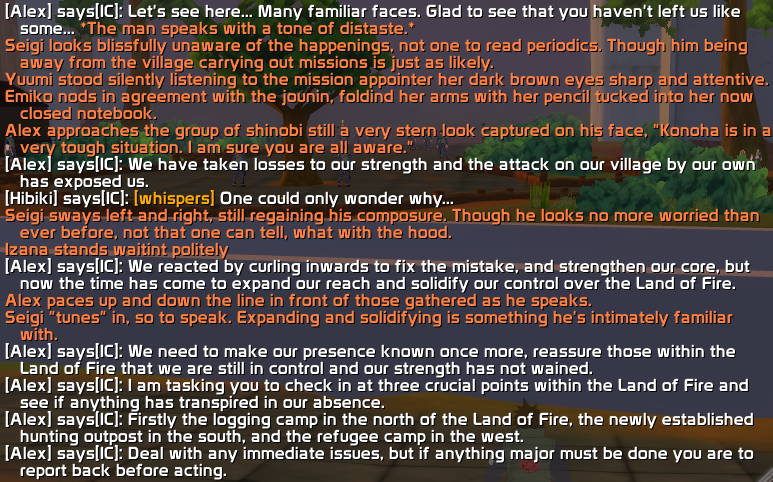 Mission Results: Seigi and his team set out after being briefed to the lumber camp to the northen border of Balance Country and the Land of Fire. 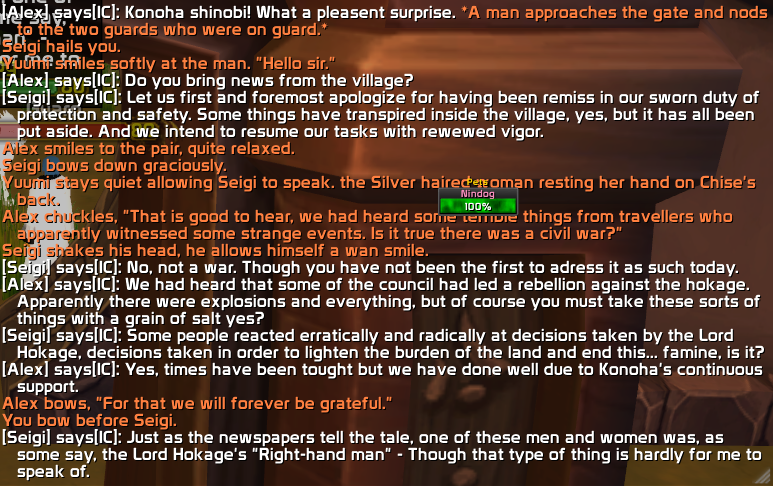 Upon arriving they discovered that the workers there were afraid of the rogues and had heard rumours of a civil war being the cause of Konoha's closure. The team reassured the workers that everything was under control and that the situation wasn't as bad as the rumours indicated. The team also reassured that help would be sent from the village to help the camp meet their quota of lumber seeing as they had fallen behind due to the wide spread panic. The next stop was the refugee camp in the south west of the Land of Fire. The team discovered a group of men near the camp who appeared to be plotting something, upon approaching the men the instantly became aggressive towards the shinobi. The shinobi reacted by dispatching all but one of the men without another word. 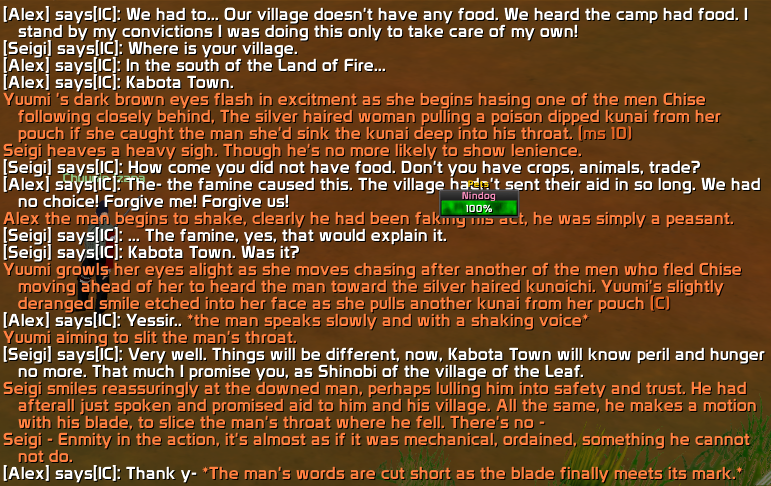 Seigi kept the last man alive long enough to hear that they were the men of Kobota Town who were attempting to get food from the camp to take back to their starving families. 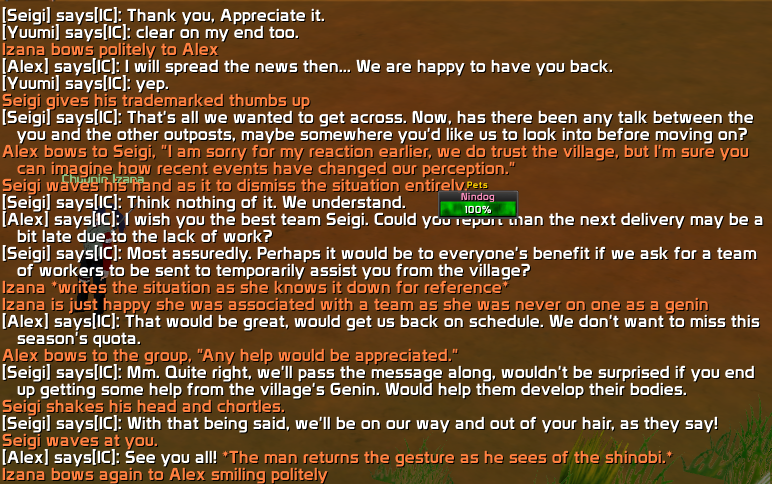 After disposing of the evidence of the fight the team approached the camp and met with presumably the leader of the camp and got an update from him. 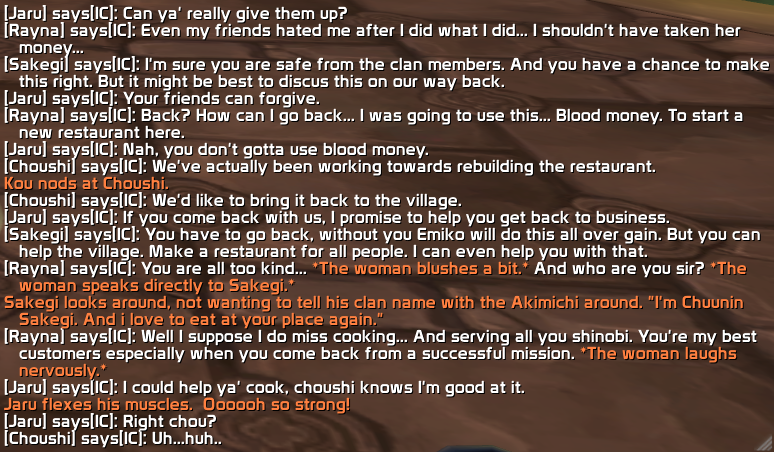 He disclosed that the rice supply was running out because they hadn't received their shipment from Konoha and that they had to turn some villagers away earlier. Lastly, the team visited the hunting outpost in the south east of the Land of Fire. 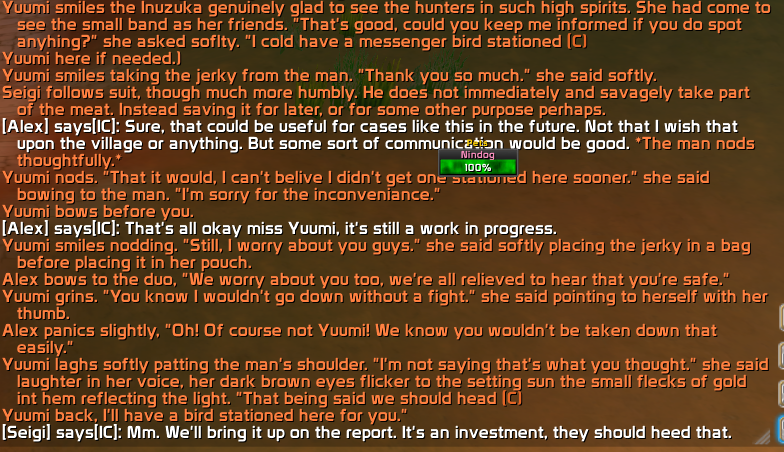 Yuumi having been the one to present the idea of the outpost and head the project was a familiar face that the team decided should do most of the talking there. They discovered that no news of the attack or the lockdown had even reached the outpost and they were carrying on with business as usual. 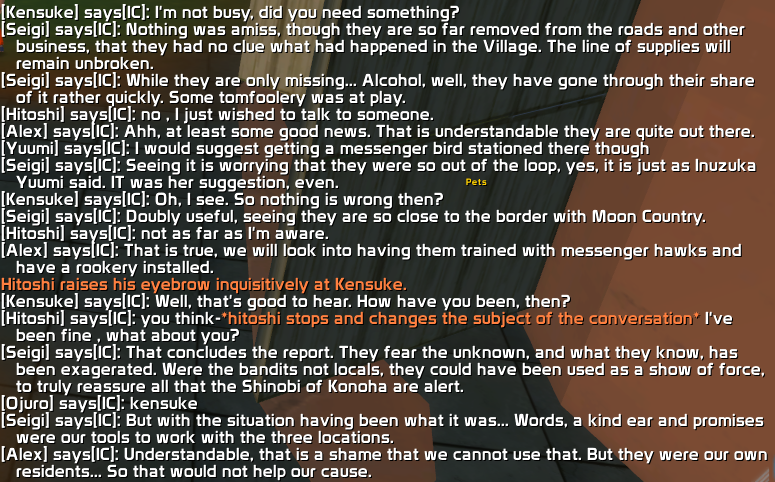 The team and leadership of the camp all agreed that some sort of communication line should be established between the outpost and the village. The agreed upon solution would was a messenger hawk rookery. The team would suggest the idea in their report. Additional Notes: Follow up missions will be held to follow through with the comitments the team made to the various contacts. 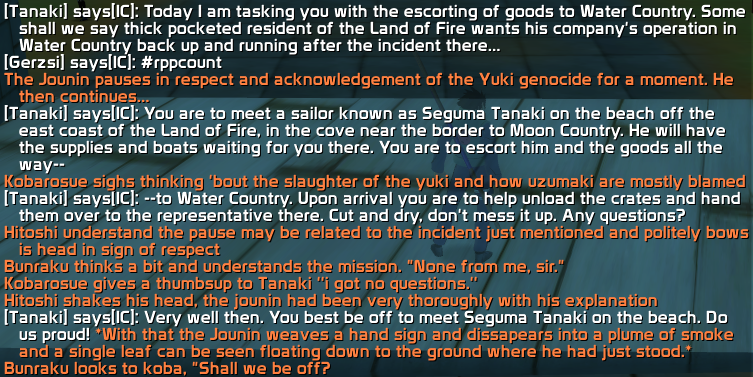 Mission Details: Seigi and his team had previously visited the lumber camp in the north of the Land of Fire to check in with them after the village lockdown. 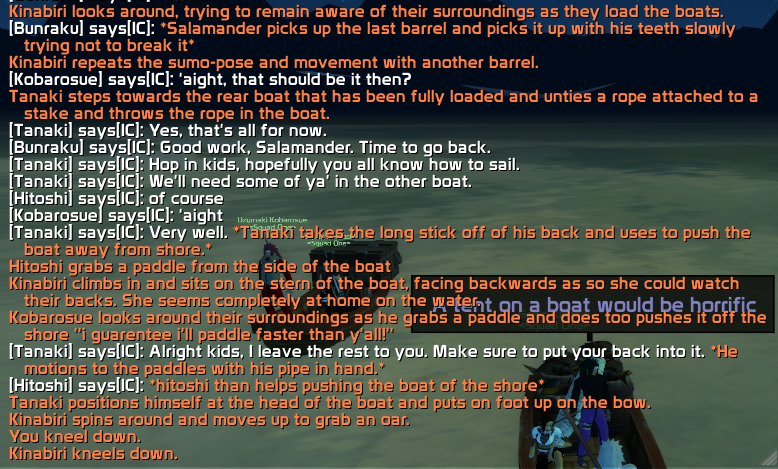 Tennzen was tasked with taking a group of Genin and Academy students to assist the lumberjacks in catching up in their lapse of work due to paranoia. Mission Results: The team successfully produced one whole shipment of lumber and returned at night fall with the promise that it would be delivered tomorrow morning along with the regular shipment. Casualties: Ojuro was struck in the face by his fellow student Shuyin. Screen ShotsTotally forgot to take any. RIP.